Q. How do I find an article from a popular source? You are used to professors requiring the use of peer-reviewed, scholarly articles in class, but you recently had an assignment that required finding a popular source. What is a popular source, and what is the best way to locate one? A popular source is geared toward the general public. It is not as reliable as an academic source, and often does not have a list of references, which can make it difficult to verify its authenticity. Examples of popular sources include magazines and newspaper articles. One way to limit your search to popular sources is by using the built-in filters within a database. A search in the multidisciplinary database Academic Search Complete, for example, will produce a results page like the one below. Use the checkboxes listed under “Source Type” on the left side of the screen to limit your search to newspapers and magazines; you will be left with a results list filled with popular sources. 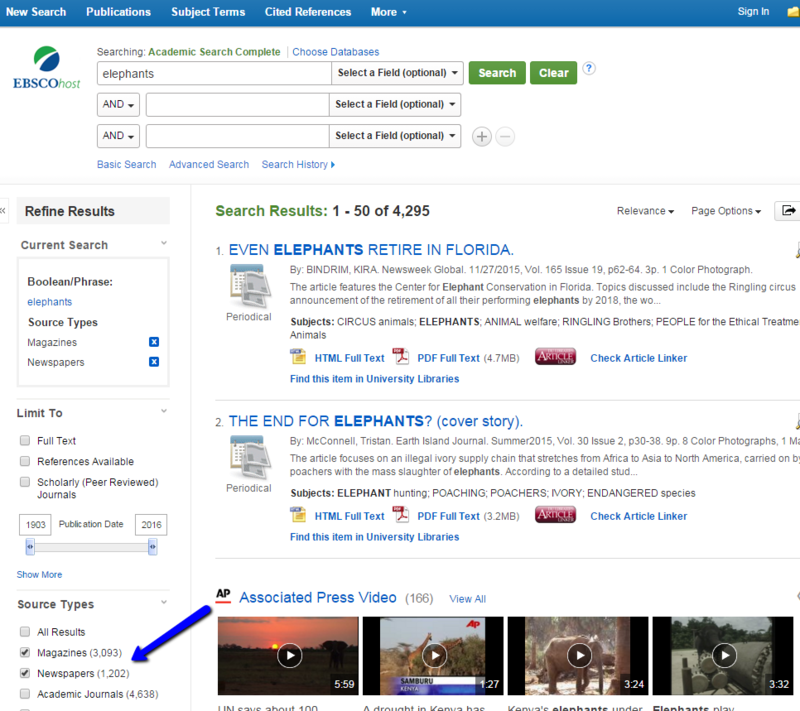 Many of our other databases have similar filters that allow you to limit your search to include only popular sources. The library subscribes to numerous databases that only contain information from newspapers. Try searching Access World News to search newspapers throughout the world or limit your search to a particular newspaper by using a resource such as the New York Times (Proquest Newstand). Check out more newspaper resources under the Newspapers (Current) link under the subject listing on the Databases by subject link on the library's homepage. Spend some time thinking about popular sources that you are familiar with that publish articles on your topic. Visit the websites for those sources and spend some time browsing the content there. Using these strategies and resource will allow you to locate popular sources effectively; if you need further assistance, the Research Center will be happy to assist you.